Eyeliner, mascara, lip gloss and hairspray are essentials to many women when starting their day. When putting on mascara it feels great to know it’s a safe product and you’re not going to go blind because of it. But next time you’re beautifying your face, look at the cosmetics you use, was the product animal tested? Now think of the animals who actually have gone blind from of it. Although many agree that products should be tested for the safety of humans, no law requires that cosmetics and household products be tested on animals. Every year millions of animals are poisoned, burned, blinded and killed in barbaric animal testing methods. Even though the results of animal tests are often unreliable or not applicable to humans, rats, mice, guinea pigs, rabbits, and other animals are forced to swallow or inhale massive quantities of a test substance or endure the pain of a chemical eating away at their sensitive eyes and skin. Watch this video “Testing 1,2,3” for a better picture of what is really going on. Although the demand for products not tested on animals is increasing, some companies such as SC Johnson, Johnson and Johnson and Unilever are still using animal testing because they have done it for so long and simply do not have the vision to try new and better ways. Many alternatives to animal testing are available today. 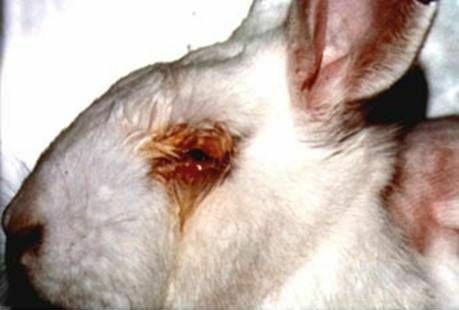 Instead of measuring how long it takes a chemical to burn away the cornea of a rabbit’s eye, manufacturers can now drop that chemical onto donated human corneas. Other effective and sophisticated alternatives like Episkin®, use artificial human skin that can replace some animal tests in a fraction of the time and cost. Technologies like these are being continually developed.These technologies can give a better idea of what the products can do to humans and not animals. To help stop this unnecessary animal cruelty, all you need to do is be a more conscious consumer. Next time you are shopping for cosmetics including any personal-care products such as hairspray, shampoo and even deodorant, check the labels to see if the product is animal tested.Sometimes it can be hard to tell what products are cruelty-free because of all of the different ways it can be conveyed on the package. The main standard suggested is the Leaping Bunny, which was put out by the Coalition for Consumer Information on Cosmetics’ (CCIC). The Leaping Bunny Program administers a cruelty-free standard and the internationally recognized Leaping Bunny Logo for companies producing cosmetic, personal care, and household products. PETA has also compiled a list of companies who do not test. You can check this list to see if the products you use made the list or search the list for your next cruelty-free purchase. What do you think about animal testing? Do you plan on ditching any of your products for cruelty-free ones? Have You Met Your Meat? When I began getting involved with animal rights and learning about animal cruelty, it all started with a video named “Meet Your Meat.” Now that I’ve decided to write this blog and share what I know, I thought it was only right to start you all off on the same foot. Of course if I’m going to tell you how to change your habits and live animal friendly, you probably want to know why you should even care. It amazes me how so many people eat the meat given or available to them, but don’t bother to question where that meat is coming from. I know I was guilty of this at one time, but now realize ignorance is not always bliss. Once I learned the conditions these animals are kept in and the cruelty they endure before being slaughtered for my own personal gain, I wanted no part of it. We see pictures of farms everywhere with happy cows grazing freely in green grass, but the reality is, most animals raised for food live miserable lives in confined, dark facilities called “factory farms.” Factory farms were created to mass produce animals and keep up with demand. 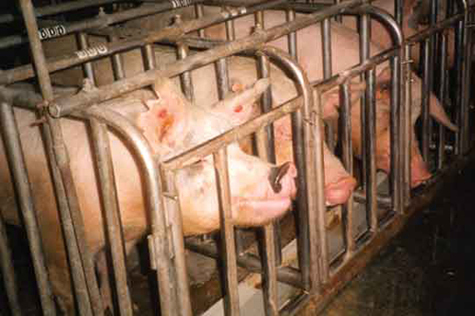 The animals are treated simply as commodities to be exploited for product. Animals used for food are genetically manipulated to grow as large as possible, as quickly as possible and often become crippled under their heavy weight. Chickens have their beaks seared off with hot blades and male cattle and pigs are castrated, all with no pain killers. The animals spend their brief lives in dark and crowded warehouses before being cramped onto trucks and transported to slaughterhouses. Many die during transport because of the harsh conditions or are so weak by the time they arrive they can’t walk off the trucks. Once in the slaughterhouses, the animals are hung upside-down and their throats are slit, often while they are completely conscious.This is the reality of where most meat comes from. Vegetarian: Did you know by becoming a vegetarian you can save more than 100 animals a year? When I decided to stop supporting animal cruelty, I decided to be a vegetarian. I don’t eat any meat including chicken and fish. Some people decide to eat only chicken, but because chicken are small, the average meat-eater is responsible for the deaths of more chickens than cows. This is why when choosing not to eat meat, chicken should be the first thing cut from your diet. I get asked what I eat just because I am a vegetarian all the time and I say “everything you do, just without meat in it.” It’s really that easy. Vegan: Going vegan is also an option. Vegan is a lifestyle people follow in which they avoid the use of animals for food, clothing and other human purposes. Vegans do not eat any animal byproducts including eggs, milk and gelatin. Although I would like to eventually transition into a vegan,it can be hard to do because the options are more limited. If you are looking for motivation, go to www.meat.org to sign a pledge to be a vegetarian for 30 days. The Web site also includes free vegetarian or vegan recipes and a free vegetarian starter kit. Other Options: If you are not willing to stop eating meat, there are other options to live more animal friendly. Humanely-produced meat from ethical farms is available. Also, organic or free-range meat is an option, but be careful because the guidelines to get these labels on products may not be as humane as it sounds or looks on the package. The animals can still be exposed to animal cruelty and conditions just as bad as factory farms. However, just being conscious of where your meat comes from can make a difference. It’s up to us to make a difference. What are you planning on doing to live more animal friendly?